puts "Listening for UDP data"
This was introduced in commit 388030b. The intention was to avoid always copying the backing array. I personally can see why this is unexpected behavior but I can also see that reverting will affect people who know how much data they will receive (well its UDP but let's pretend it gives more or less what you expect). So I wonder if we should apply a heuristic here? Don't copy if n% of length is filled from the recvfrom (n == 100%/80%??? ), but if not then call with copy constructor which will right-size the String made. I am looking for opinions. The revert and the heuristic are trivial to do but what is the best way to give the speed benefit while not creating this massive over allocation in a case where you get much less back than you asked for? Although our behavior seems to match CRuby, we agree this isn't an efficient use of resources when the requested size is significantly larger than the actual data size. At this point I'm leaning toward having a heuristic, where if the requested size is greater than (for example) 1.5x the actual data size, we crop it when returning the string result. 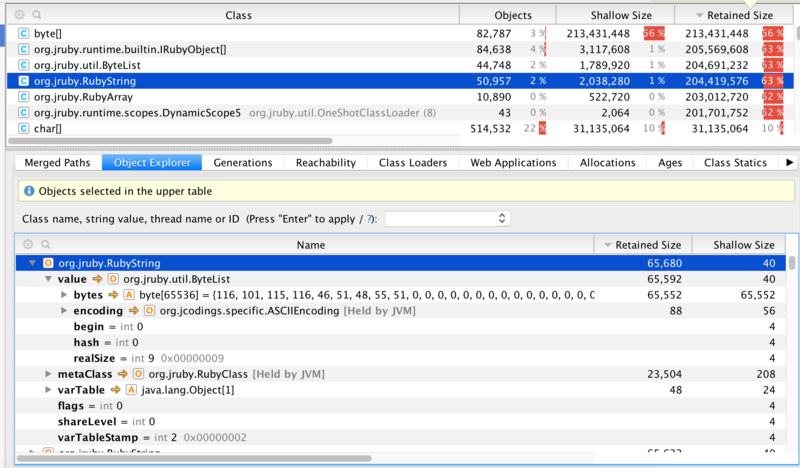 However, in both JRuby and CRuby it appears that every call to recvfrom(64k) is going to allocate (and possibly throw away, if we copy) a 64k buffer every time. Yeah so the second idea we talked about was potentially doing n recvfroms with a bounded allocated buffer in a loop and building up a string. This felt a bit dubious to us because you are requesting something fairly specific (a single 64k recv_from). Us doing n of those calls for you maybe is a semantic gap too far. As an aside, does UDP really ever reliably read a 64k data packet? I think that is a theoretical limit but one I doubt will work very often. Seems like reducing that size in your code could end up speeding things up because we won't speculatively try and allocate a large buffer for your call. As an aside, does UDP really ever reliably read a 64k data packet? It's a matter of safe defaults, we don't want to surprise users by defaulting to truncation at an arbitrary length. @jsvd well that is interesting. Either something we missed in MRI upon making the string originally or something else which is reducing the unused backing store in the COW stuff in MRIs String impl. Yeah I can see the use case that when you don't know what will be arriving you just grab as much as you can. My question was mostly just me remembering how flaky UDP can be. @jsvd Hmm I'll have to go over the code in MRI again then. If they're truncating the buffer somewhere, I can't see it. There might be a realloc call hidden in there somewhere hiding the truncation.